This Water Forum addresses current regional water issues that threaten or negatively impact the health and presence of local water resources, and especially the ecosystems that provide that water. Possible solutions and choices are presented as we reflect on what we can do as a community to assure the purity of the regional water supply, by respecting and protecting the viability of the natural ecosystems that provide the water upon which all life depends. The Rights of Nature approach is one effective way to prevent degradation, abuse and misuse of water. For more information: boulderrightsofnature.org. 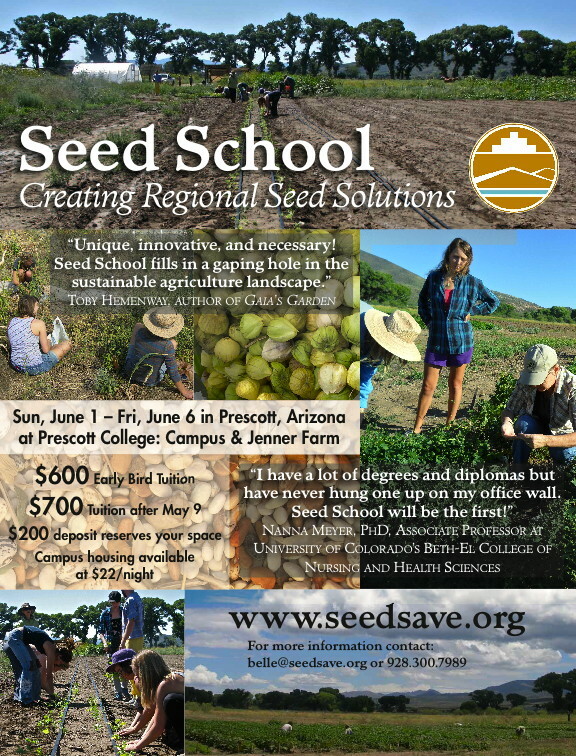 Seed School is a groundbreaking, six-day educational course in Prescott, AZ, that trains people from all walks of life to build local seed systems rooted in the ancient tradition of seed saving. Practiced by farmers and gardeners for thousands of years, seed saving strengthens food security at the community level, empowering people to reclaim control over their food supply. 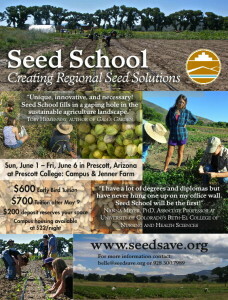 Students walk away from this innovative learning experience with the knowledge and inspiration to start their own independent seed initiatives, such as community seed libraries and exchanges, seed growers cooperatives, heirloom seed businesses, and participatory plant breeding projects. Details here. Gary Paul Nabhan is an internationally celebrated nature writer, seed saver, conservation biologist and sustainable agriculture activist who has been called “the father of the local food movement.” He is the author or editor of more than two dozen books, including Enduring Seeds and Renewing America’s Food Traditions. Gary is co-founder of Native Seeds/SEARCH. Campus housing available at $22 a night. $200 deposit reserves your space. The 2014 course will take place on the first weekend of every month beginning October 4th & 5th and concluding April 4th & 5th, 2015. The first weekend will be an overnight retreat at Woodbine Ecology Center in Sedalia. Most other weekends will be held at The GrowHaus here in Denver. For a complete course calendar please refer to our syllabus. The Denver PDC is recommended for design professionals, urban farmers, community organizers, foodies, city planners, green entrepreneurs, homeowners, and anybody seeking a comprehensive framework for sustainable change. Course tuition is $1050 with a $250 deposit before July 15th, or $1250 after July 15th. Please click here to register today! Questions? Please see our FAQ page on our website or feel free to email us. Water is a critical component of agriculture in Boulder County. The Water Tour 2014 is a collaborative effort between Boulder County Parks and Open Space and Farmers Alliance for Integrated Resources (FAIR) with the support of local conservation districts, ditch companies and businesses. New stops for 2014 include the Highland Ditch Diversion and the Left Hand Water District Spurgeon Plant. We will also revisit a couple stops from previous years but have no worries if you’ve attended in the past, after the September 2013 Flood, the landscape no longer looks the same. There will be speakers on the bus as well as at each stop with time for questions and discussion. Lunch is included in the $20 registration fee. Pulled Pork sandwiches + sides will be served, with a vegetarian option available. For more information please visit the registration site or www.BoulderCountyOpenSpace.org/ag or contact Meaghan Huffman, mhuffman (at) bouldercounty.org or 303-678-6181. There has been so much coming alive and we are so excited to share at our annual screening series, the film NEW SOLUTIONS with you all on the beautiful back patio of TRIDENT BOOKSELLERS and CAFE! We will share Earthship enthusiasm and support Boulder’s best coffee shop. This gathering is to open or continue the conversation with interesting people, like minded folks, update you on our movements, and watch a super inspiring film that’s just released! Sandy Cruz will be traveling out of her home state of Colorado to co-teach a Permaculture Teacher Training Course with Peter Bane in Ann Arbor, MI. The course is taking place November 9-13, 2014. These master teachers have trained more than 2,000 permaculture students across the Americas. As Peter says, “Lift Your Game”. PDC is a prerequisite, and an application is required. Course fee $800 by 9/1/2014. See flyer below for course details and registration information. You can read a review of Peter, Sandy and Becky Elder’s Permaculture Teacher Training course that took place last August in Colorado here. 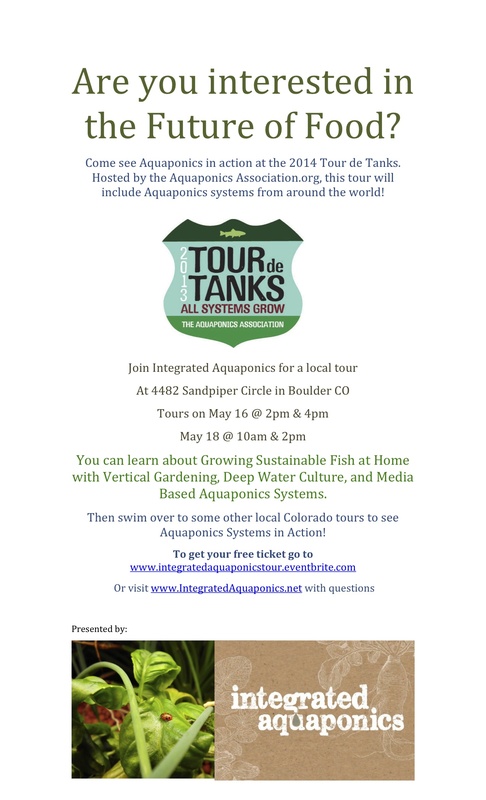 There will be a tour at my house to see my aquaponics systems in action, my geodesic dome, and other fun permaculture science toys and connections to be made. The tours at my house will be on May 16 @ 2pm & 4pm and May 18 @ 10am & 2pm. There are other local tours in the Boulder area from some of my past students. 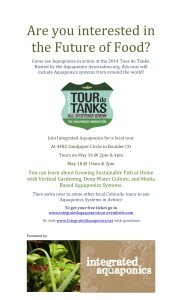 The attached flier is for the tours at my house only, and I created a registration page for people to get their free tickets at integratedaquaponicstour.eventbrite.com The event is organized by the Aquaponics Association and includes tours of aquaponics systems across the country. This google tour map shows where the tours will be hosted (https://mapsengine.google.com/map/edit?mid=ze_CTCF3_ZGE.kmTeHLCcF8Jc) Hopefully you can make it to one of my tours and invite some friends! Also, feel free to share this flier with your network. The Colorado Greywater law is developing slowly but surely. We finally have the state plumbing board in the conversation and this Friday morning will be our first workgroup to include the plumbing board and the dept of public health at the same table. I will be there with a group of permies to represent simple systems and the need for the law to be inclusive of many possible solutions. Please let me know if you have interest in helping with the development of this law, as I could use all the help I can get. And stay tuned for more info in the coming months.